Ho hum, another draw in Bonn. 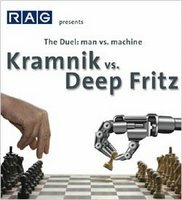 Kramnik squandered his last opportunity to defeat Fritz with the white pieces. He must win game 6 to salvage a draw in the tournament, but with Fritz playing white, and with Kramnik unable to figure out this excellent chessbot, an overall loss seems most likely.